If I could retrieve all the other photo's from Photobucket I could fill several more pages. I did get some of them but can't remember how I did it!!!!!! Bummer. This is an interesting thread. The deer I took last year was with a powder coated 240 Keith SWC at 1035fps ... long story, but at the time I thought it was a tad hotter. I think my new project will be to add another 1/2 grain of Unique and see if accuracy holds. Some years ago John Linebaugh did a series of comparison tests with heavy weight cast bullets. He concluded that "...a dependable cast slug, not too hard, not too soft, at a moderate velocity not to exceed 1300 fps and let caliber and bullet weight do the job..." He went on to state that his preference was 1200 fps. I load between 1100 and 1200 fps, depending on caliber. I prefer 1100 fps in my 45/70 and 480 Ruger revolvers and 1200 fps in everything else. 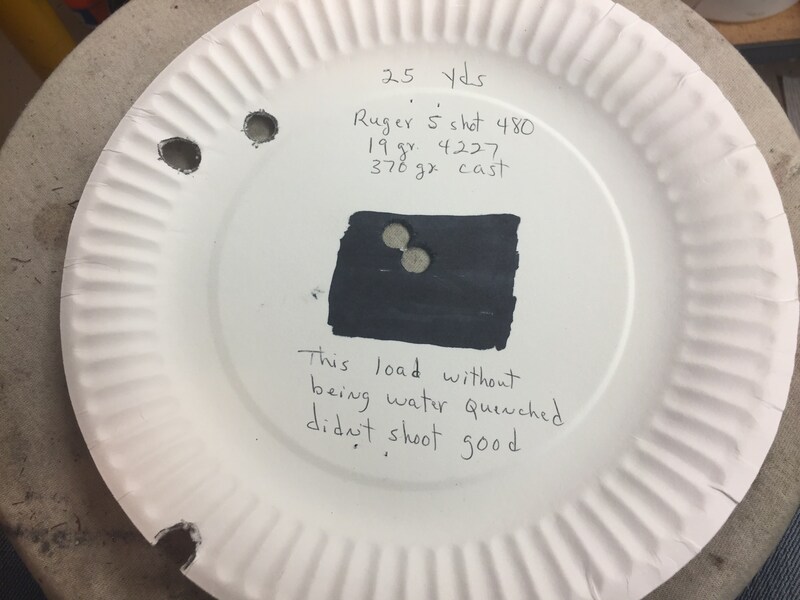 THERE HAS TO BE AN OPTIMUM VELOCITY RANGE FOR HARD CAST LEAD BULLETS FOR THE BEST COMPROMISE BETWEEN BULLET INTEGRITY (MINIMAL DEFORMATION) AND PENETRATION. 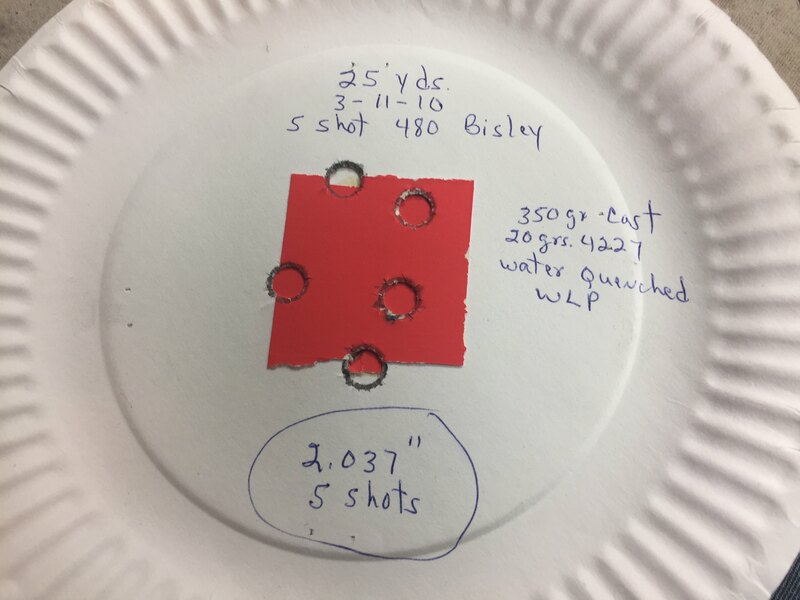 THE TOP RIGHT HAND BULLET WAS A 325gr WFN SHOT OUT OF A 5 1/2 INCH CUSTOM 45 COLT TLA REVOLVER @ APPROX, 1,325 fps INTO A LIVE WATER BUFFALO AT ABOUT 30 YARDS, AND, AS YOU CAN SEE THE BULLET NOSE WAS BEGINNING TO BE COMPROMISED, BUT, AS I RECALL, THE PENETRATION WAS ACCEPTABLE. THE LOWER BULLET WAS A 200gr FN SHOT OUT OF A 357 MAX CONTENDER @ ABOUT 1,750fps INTO THE SHOULDER OF A WHITETAIL BUCK @ 95 YARDS. THIS BULLET's INTEGRITY WAS SERIOUSLY COMPROMISED AND IT DID NOT PENETRATE STRAIGHT. 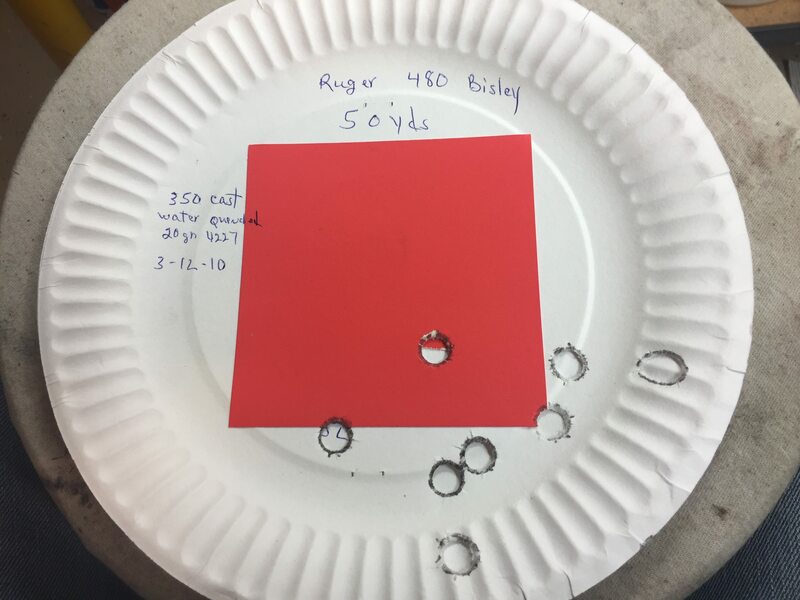 I HAVE NOTICED WITH MY 45 COLT OUTDOORSMAN LOADS (A 250gr OTBC RNFP @ 1,350 fps) THAT BULLET INTEGRITY STARTS TO SUFFER (PRIMARILY SOME NOSE DEFORMATION) ON SHOTS AT 60 YARDS AND UNDER. SO MY THINKING IS THAT THE OPTIMUM VELOCITY FOR BULLET INTEGRITY AND PENETRATION MAY BE SOMEWHERE UNDER 1,300 fps. I KNOW A LOT OF YOU GUYS OUT THERE HUNT A LOT MORE THAN I HAVE, OR DO, WITH CAST BULLETS AND ARE BOUND TO HAVE MORE EXPERIENCE AND RECOMMENDATIONS. SO HOW FAST IS TOO FAST? I?ve used pure wheel weights water quenched up to 1400 FPS with excellent results on Alaskan Yukon moose with 50 plus inch spreads as well as grizzly. John is correct, as velocity goes up bullet hardness has to go with it. Although I prefer to shoot my cast bullets as soft as I can & still get accuracy once you go so far speed wise you have to raise the BHN of your bullets. Here's 3 different targets I shot with one of my 480's a few years ago just to prove a point. The first target is 25 yds, the second target is 50 yds with 2 shots going a tick low but still a decent group at 50 yds with iron sights. The third group is the same load but the bullets weren't water quenched & you can see how the group opened up, even at 25 yds. It all goes back to matching the hardness to the velocity. 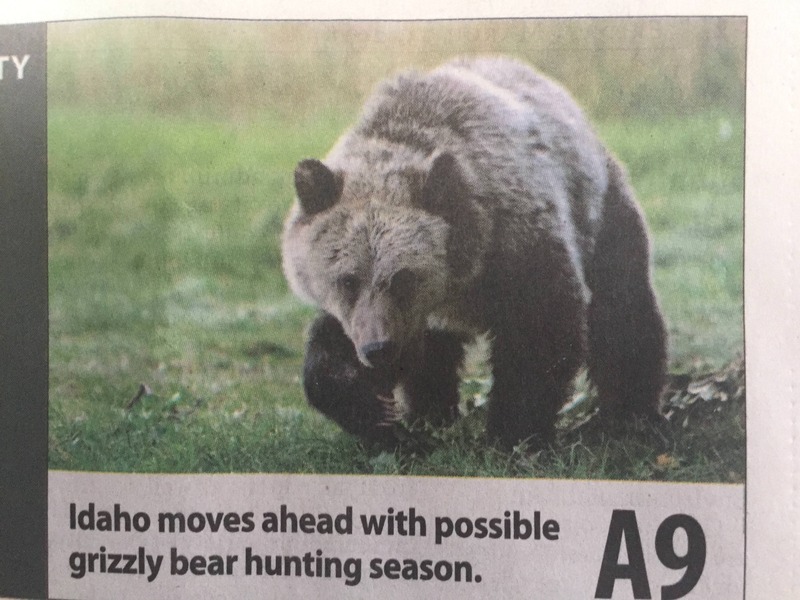 Almost forgot, Idaho is probably having it's first Grizzly hunt in over 50 years this fall, hope I get lucky! Only 3 hours away! .... Almost forgot, Idaho is probably having it's first Grizzly hunt in over 50 years this fall, hope I get lucky! Only 3 hours away! I've done a little reading and it appears that they would only allow 1 Boar to be killed in Idaho? Is that correct? Snyd, yes the 3 states are getting the ok for a hunt this fall but Montana is going to pass this first time around, not sure why. Idaho is going to go with one permit, again not sure why, we have lots of bears! Wyoming is going with 24 bears!! Like so many others here I always chased that speed years ago, now all but my varmint revolvers are as has been stated, 1000 to around 1300 fps max, most 1150 to 1200 with heavy for caliber bullets, and seem to have better results than them early years, imagine that? I also find the last couple years have started using reflex sights, as them most productive hours of first and last light I just can't find the sights on the dark background. I am sure as I continue to age there will be even more changes.